Gail Bourgeois, the first artist to exhibit in the RIA Artist Project Room has produced a booklet in conjunction with this exhibition. Using drawing in a variety of formats and series, in my work I explore the difficult themes of our relation to others, to nature, and among ourselves. Inspired by war reports and the normalcy of violent imagery, Incidental things, my latest series of drawings and small plaster objects, juxtaposes tenderly rendered images of maimed, ill and broken parts in careful arrangements meant to signal attention or care. I am investigating different ways of expressing human frailty through a philosophical understanding of the complexity and vulnerability in being human. The series comprises thirty-nine drawings on Mylar. Every drawing is unique in its tender rendering of society’s leftovers and absurdities. The small scale of these drawings reinforces the idea of intimacy. Through the depiction of an uncertain space, I want to impart an idea of the aftermath of something gone wrong. Small objects cast in a brittle plaster reference the human body in the form of feet or shoes or the imprint of such. They suggest specimens as evidence of a person or thing that was once there. Other presentations forward a notion of witnessing. Something has already happened that must be remembered and made visible. Each piece has a different gesture and at the same time carries the affect of its multiplicity. The drawings and objects follow an idea of things thrown away being recuperated but stripped of context and staged. The objects echo the drawings through an austere presentation and their shared emphasis on anxiety and alienation. Notes on Gail Bourgeois: Incidental things. In the RIA Artist Project Room, thirty-nine drawings are hung with office clips into a grid pattern, as if to mimic a systemic forgetting of violent events. It creates an order that equalizes each individual drawing, and, by metaphorical extension, each “incident” that is represented, no matter how unique. The loss of a focal point makes it difficult to focus on one particular rectangle. Uniformity is intensified by the source for the drawings; plaster cast shoe forms, although all slightly different, have a similar bland, smooth shape in common, which removes their representations several times from the horrid, specific realities of broken bodies. But the delicacy of the small drawings, the fine, sharp lines contrasting soft shadings, entices you to make an effort and choose one out of the many, to be drawn into its intimacy. Once inside you notice the gentle transformations that bring difference and vulnerability to objects that seemed once identical and composed. These “incidental things” were handled with care, with a tenderness that shows the artist’s understanding of human frailty, and a desire to make things better. A discussion evening with the artist, with Petra and René, and writers/curators Sandra Dyck, Judith Parker and Jeanine Parkinson, brought out different ideas on the work, and slowly, in the exchange of perceptions and opinions, some consensual evaluations. Gail had chosen to integrate most of the sculptural objects with the furnishings in the adjacent living room, away from the “gallery” wall with the drawings, while a heap of relatively unaltered casts covered a corner of the gallery room, underneath some large plants. In the living room, altered and assemblaged casts were positioned casually, as if someone had forgotten to put them away: near a wall, under the coffee table, near the fireplace and on bookshelves. During the discussion, we tried different placements for the sculptural objects. When pulled out from their positions in the living room and placed on to the hardwood floor in the gallery room, they gained a “presence” and showed their individual differences to better advantage. Thematically, however, the relationship to the drawings became less strong. 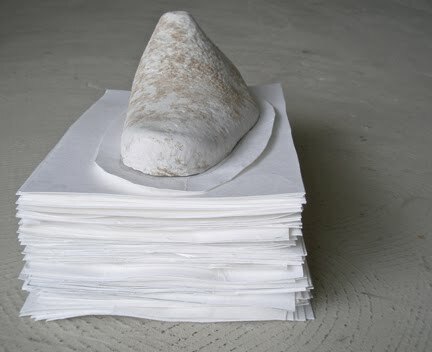 Gail had differentiated each plaster cast drawing with subtlety, and the pile of unaltered casts in the corner held their relationship to the subtleties of the grid. But the more pronounced differentiations in the casts that were configured with found objects, began to seem like a playful exercise in formal inventiveness, when seen on the hardwood floor. They wanted their own territory, a different space with a different mandate. On a personal note, it is a fascinating experience to live with Gail’s art and have people come in to see it and comment on it. The drawings especially are working on me; first they affect me emotionally but then they work their way into my brain. And I am getting attached to the corner space of the gallery room. Underneath my large asparagus fern, just brought in from the garden for the winter, lies the mess of forlorn plaster shoe forms, each one slightly different from the other. The fern is dropping its leaves as if wanting to cover the “incidental things.” Above the plants and the objects, my painting of the inside of a greenhouse, shows rich growth under glowing lights. There is a strange coincidental sympathy between the plants, the casts and the painting. They take on a life of their own and are trying to tell me something. I will listen and think…..